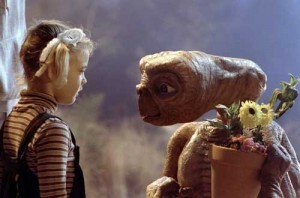 For the 30th birthday of Steven Spielberg’s (Empire of the Sun) brilliant and heart-warming science-fiction movie E.T. The Extra-Terrestrial, we get the best gift in this Blu-ray, the film’s high-definition debut. Like the restoration and high-definition presentation of Spielberg’s Jaws on Blu-ray, E.T. looks remarkable. (And, thankfully, it has guns again!) The picture is outstanding, with glorious color, like E.T.’s flowers and his blazing red heart. The sound is great too, with all the screams and cries and John Williams’ (War Horse) awesome score clear. As well as the restored family movie, the set has two new special features. One is an interview with Spielberg as he reflects on the making of the movie. He explains that he got the idea for E.T. while he was working on Close Encounters of the Third Kind and worked with Melissa Mathison on that screenplay. Although he said the original script for E.T. was the best he had read so early, he had no expectations for the movie other wanting it to be at least as good as the script. The second new bonus feature is the two-part documentary “The E.T. Journals.” Much longer, this piece is a compilation of on-the-set footage and old interviews. It shows Spielberg directing young actors Henry Thomas (Dear John) and Drew Barrymore (Big Miracle), palling around with them on Halloween and the secrets of how the puppet of E.T. worked, long before characters like this were created in computers. The footage shows Spielberg behind the scenes and later with composer Williams (War Horse) as they began working on the movie’s music. The set also contains all the special features from the Two-DVD Limited Collector’s Edition released in 2002 for the movie’s 20th anniversary. Although they’re not new, they’re good and welcome in this set. Some of the featurettes have similar footage as “The E.T. Journals,” like “A Look Back,” although that also offers interviews done in 2002. There is a lot of overlap, with Spielberg’s Halloween costume looked at in “Journals,” “A Look Back” and the 2002 featurette “The E.T. Reunion,” but each has its own unique pieces too. There’s also two fun deleted scenes, one with E.T. taking a bath that’s good for a giggle.